Carnivore Meat Company is voluntarily recalling Vital Essentials Freeze-Dried Beef Nibblets Entree for Dogs for possible Salmonella contamination. No reports of pet or human illness have been received by the company to date in connection with this issue. 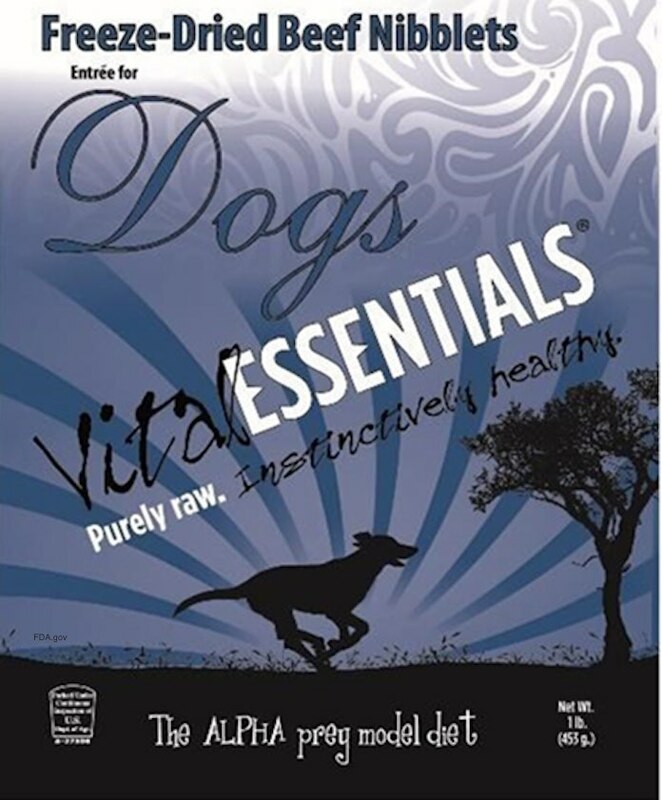 The recalled product is “Vital Essentials Freeze-Dried Beef Nibblets Entree for Dogs.” The product was sold in one pound bags throughout the country through independent retailers. It was also sold through online retailers Chewys.com and Amazon.com. The lot number of the recalled product is 13753. No products other than the specified product have been recalled. A single batch of this product tested positive for Salmonella bacteria at the Michigan Department of Agriculture. If you purchased this product, do not give it to your dog. Throw it away in a well sealed package to other animals can’t get at it, or take it back to the place of purchase for a refund. Pets can get Salmonella infections, and pass that infection on to people. Dogs can shed Salmonella bacteria in their feces, which can then get onto their fur. When people handle contaminated pet products, the bacteria can transfer to their hands. Then, if they touch their mouth without thoroughly washing their hands, they can consume the bacteria. Pets can have the Salmonella bacteria without showing any signs of illness, but pass it on to pets and humans. Pets who are sick with Salmonella infections may be lethargic and experienced vomiting, fever, and diarrhea that may be bloody. Some pets will only have decreased appetite, fever, and abdominal pain. If your pet has been experiencing these symptoms, see your doctor. People with Salmonella infections experiencing abdominal pain and cramps, fever, nausea, loss of appetite, vomiting, and diarrhea that may be bloody. A Salmonella infection can have lifelong health complications, including endocarditis, reactive arthritis, eye irritation, and urinary tract symptoms. If you or anyone in your family is experiencing these symptoms, see your doctor.